I enjoyed reading your spin on Andy's Post Office voting. 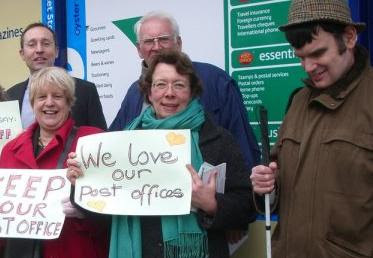 Essentially he's saying he's not bothered about post offices closing elsewhere around the country - those poor, blind and elderly folk are not his problem. Just the one's that vote for him count (and of course ensures he's in as many photos as possible taking all the credit!). You don't seriously believe educated readers fall for that, right? I wouldn't have included him in this post if I were you, it makes you look just as hypocritical as he does.